Ombo Rest Camp is situated approximately 12 kms North of Okahandja on the Hochfeld Road. This unique environment is home to a variety of animal and bird species, and they can all be viewed at our waterhole accompanied by a beautiful sunset. Ombo Rest Camp provides the ideal midway stopover, whilst allowing our guests to experience a relaxing and peaceful stay, and for families, a child-friendly environment. 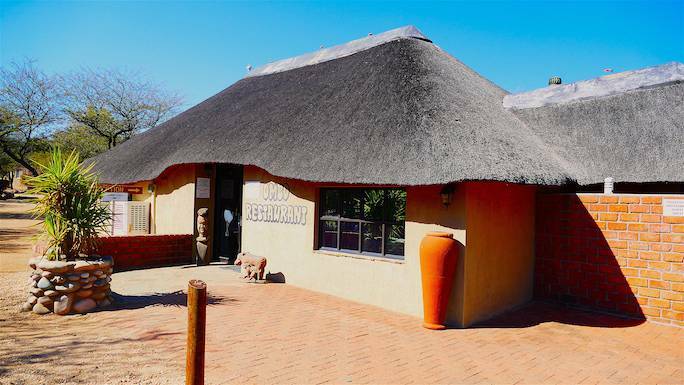 Our family restaurant serves an A-La-Carte menu, meat dishes, vegetarian dishes, various salads, seafood and for the Namibian taste, ostrich meat and eggs. We also offer crocodile meat, Omajovas and freshly baked caked every day. When the road becomes too long, we offer overnight accommodation. Come and visit us for a tour to see the ostriches and crocodiles. Even for a short stopover/visit you can enjoy our ostrich and crocodile tour, view our two warthogs and turtles. Afterwards you can relax at our restaurant and enjoy one of our freshly prepared meals from our menu.